As a Clairemont Mesa resident, I’m excited that I’m able to walk to 85ºC and slew of other restaurants in the area. Granted, they’re all chains but having choices is part of the fun. And I’ve been to all with mixed results. Chicken Charlie’s FRYBQ, in my opinion, is really a one-visit type of place and unless you’re really missing the fair doesn’t need to be in your restaurant rotation. And Boudin is really just an excuse to carbo load if the lines at 85ºC is out the door. And although Ototo Sushi is passable, the problems with service will keep me out of there for a while until they can smooth it out. 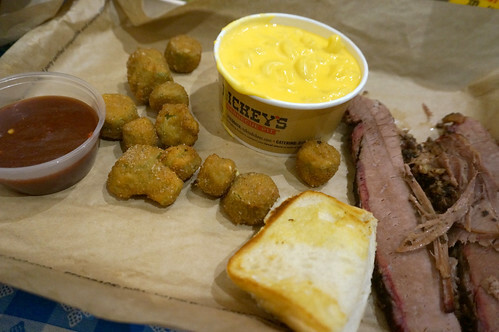 Which leads us to Dickey’s BBQ across the street. Curious enough, it’s right next to vegan restaurant Native Foods which I surprisingly enjoy. But back to Dickey’s. We happened there one Friday night for a relatively early dinner. At one week since its opening, it seemed like all of Clairemont was out for chain BBQ food. After some confusion of where the line started and ended, we both settled on one-meat plates that included a choice of two sides and a bun. By the time we finally were at the front of the line, sides were starting to run out (no baked beans for Paul). We got the last of the potato casserole, the mac ‘n’ cheese looked a tad soupier than I like and the bun that accompanies all plates looked to be part of a roll used for their sandwiches. On asking about the roll when our trays were handed out to us, the lady at the casher confirmed without question that the measly portion was “the roll.” Paul’s plate fared no better looking like the top half of the same bun. Conditions for a Friday night were cramped, condiments were constantly running out and the bun just got us down. Overall, the meat was OK and didn’t have that authentic, long smoke taste. Definitely not worth the wait. (According to the diagram by ordering station, the total weight of one meat plate should equal .19 lbs.) Aside from the starring component, the sides were pretty good. I loved the okra and mashed potato casserole but as a BBQ venue, I give it a complete pass. At least we made it up with a free vanilla cone. I am not impressed with Dickey’s. I feel like I’ve been to one somewhere else and was only satisfied because I got an ice cream cone at the end of the meal. Having said that, free ice cream goes a long way in getting me in the door. Hahaha! Yes, amazing that free ice cream quells a lot of complaints. Now only if they had a built-it-yourself sundae bar. What the hell! That doesn’t look like a roll at all and the rest of the plate looks mighty sad. Yes. I hope they get into shape soon at least inform the rest of the people in line when things start to run out. Blerg. What a sad excuse for a roll. Obviously, they used part of a sandwich so they have something to give you.